Yangon, formerly known as Rangoon, is a relatively quiet and charming city. Its impressive colonial and spiritual heritage makes it one of the most fascinating cities in Southeast Asia. (Early check-in subjected to room availability). This morning your guide and car will pick up from your hotel and we’ll take a journey by road to Kyaikhtiyo, the Golden Rock. On the way, we’ll stop in Htaukkyan township to visit the Allied War Cemetery. This beautifully-landscaped, peaceful area is the final resting place for more than 27,000 Allied Soldiers who perished during the World War II campaign in Myanmar. Arrive at Kyaikhtiyo base camp (approximately 5 hrs). Travel by local, open-air truck along a winding road (1 hour) where you be dropped off at bus station. After a few minutes walking, reach the Golden Rock. 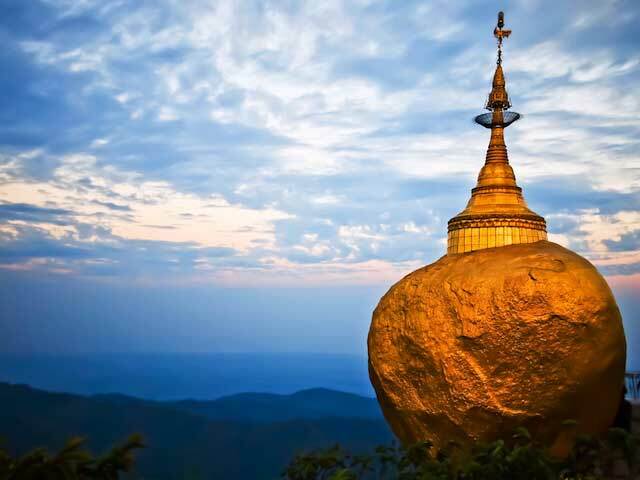 A huge boulder covered by gold leaf and delicately balanced on the edge of a cliff, Golden Rock is one of Myanmar's main pilgrimage sites. The pagoda here is said to hold a hair of the Buddha and Buddhists from across the country come here to pay homage. After breakfast, return to the base camp by open-air truck and begin the return journey to Yangon. En route, stop to visit Bago. Bago, also known as Pegu, was the capital of the Mon Kingdom in the 15th century and is a town steeped in legend. The sites in Bago are spread out around the town and you’ll spend time exploring with your guide, learning about the history and myths of the city. Stops include the 55-metre long reclining Shwethalyaung Buddha, the four seated B uddhas at Kyaikpun and the old palace of Kambozathadi. The Mon-style Shwemawdaw Pagoda is the most outstanding religious monument in Bago. This golden temple stands at 114 metres tall, higher than Yangon’s Shwedagon Pagoda, and can be seen from around 10 kilometres outside of the city. While in Bago we’ll also take time to visit the city’s local sites, including the town market and a Mon neighborhood where the locals once produced woven textiles. From Bago we’ll return to Yangon this afternoon. Arrive back in Yangon and transfer you to your hotel where remainder of the day is at your leisure. 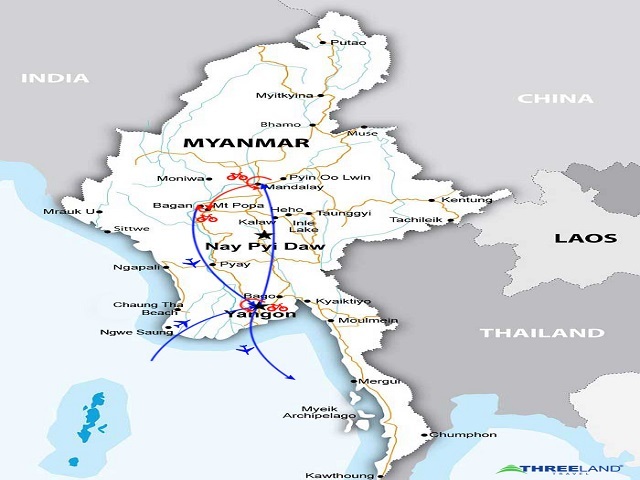 After morning breakfast, you will transfer to Yangon airport and take the flight to Bagan. Bagan, located on the banks of the Ayeyarwady (Irrawaddy) River, is home to the largest and densest concentration of Buddhist temples, pagodas, stupas and ruins in the world with many dating from the 11th and 12th centuries. The journey begins with a visit to Thagyar Pone Temple, a temple with spectacular views over the surrounding plains. This is the perfect introduction to the grandeur and scope of Bagan’s architecture. Next, continue to Ananda Temple, one of the most venerated temples in Bagan, enjoy it in the quiet of morning before all the tour buses arrive. Afterwards, we head to Myinkaba Village and visit Gubyaukgyi Temple, noted for the beautiful mural paintings on its inner walls and well-preserved plaster carvings on its exterior. Nearby is Manuha Temple and Nan Paya Temple, two smaller temples with nice Buddha statues and stone work that we will check out. Then, learn more about local culture with a visit to two workshops producing Bagan’s most famous products: lacquerware and woodcrafts. Watch as the skilled craftsmen use techniques passed down through generations to create beautiful handicrafts. Take a break with lunch at a local restaurant (own account) and then return to the hotel for a short rest and escape the extreme heat of the midday sun. Later in the afternoon, take a relaxing horse cart ride through the temple area, winding along tiny roads past dozens of monuments. Stop at will to take photos or explore temples. Continue to an elevated temple to watch an unforgettable sunset over the plains before returning to the hotel. Discover one of Bagan’s most famous legends while following in the tracks of King Anawrahta and his precious white elephant. Legend states that the King was given a replica of Lord Buddha’s tooth. He placed this relic on a sacred white elephant’s back and set him free. The elephant stopped at four places around Bagan and, later, four stupas were built at each of these locations. Thus, the local Burmese believe that by visiting all four of these places in one day all wishes will be fulfilled. 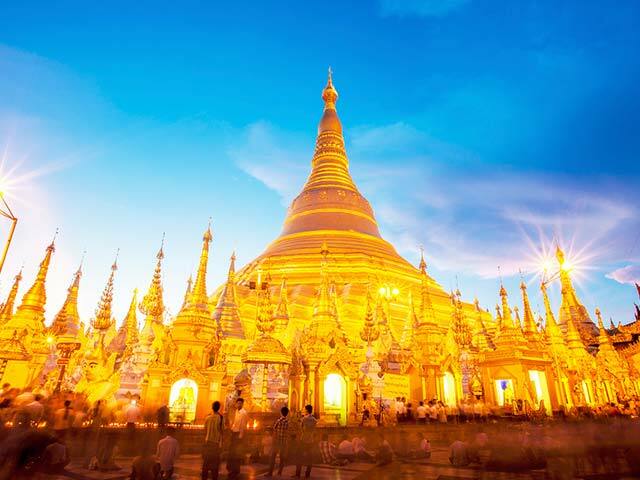 Meet with the guide and driver in the morning and begin with a visit to Shwezigon Pagoda. Although this is one of Bagan’s most famous sites, few people realize the legend behind its creation. Learn about this story, the pagoda’s importance to local people, and about some of its quirky features while taking a guided tour around it. Then, continue on to Tu Yin Taung, a hilltop stupa in the eastern part of the main Archeological Park. While approaching the temple, be greeted by 500 monk statues lining the road. The stupa’s elevated location offers fabulous views of the surrounding plains, a unique perspective of Bagan and a picture-perfect photo opportunity. The next stop is Lawka Nandar, which is in New Bagan next to the Irrawaddy River. Lawka Nandar is a bulbous stupa with a cylindrical bell and three octagonal terraces as a base. The temple still functions as a place of everyday worship as it is home to a Buddha relic. In the afternoon we drive to the jetty where a private boat is waiting to transfer us across the river to Tant Kyi Taung, the last temple of the tour. While the cruise crosses the Irrawaddy River, take in fantastic views of temples in the distance. Then, travel by truck (approximately 15 minutes) through the countryside to Tant Kyi Taung. This temple is of unique importance in Bagan, as it is thought that the Buddha stopped on the hill where the temple now stands. On the return drive to the jetty, stop in Tant Kyi Village for a short walk around. Then it is time to return to Bagan, first crossing the river by boat and then continuing to the hotel by car. After breakfast, visit the lake’s morning market. The market rotates its location around the lake’s villages in a 5 day rhythm and is visited by lake inhabitants and surrounding hill tribes who come to sell and trade their wares. (Note: market is daily except on dark moon day and full moon day). From the middle of the lake, continue down a small canal leading to Indein populated by ethnic Padaung (“long neck women”). You’ll walk on a covered alley lined on both sides with a thousand pagodas. Continue on foot by a long covered staircase to discover the magnificent complex of Alaung Sithu in a beautiful scenery of ancient stupas buried in vegetation with a panoramic view of the lake. This afternoon is your leisure at hotel. Overnight on Inle Lake. This morning fly to Mandalay. Mandalay is Myanmar's cultural capital. The nature focus of the city is an abrupt hill, rising above a vast moated and walled square. 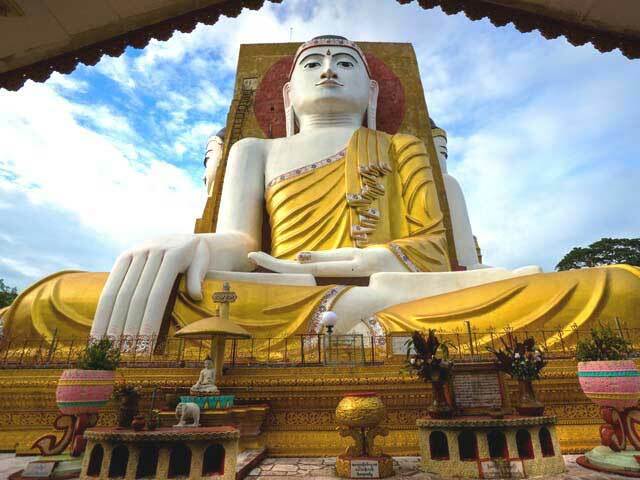 In the afternoon, we'll first visit to Mahamuni Pogada, 13ft-high sated Buddha image which is one of Myanmar's most famous. Continue your tour of Mandalay with a visit to Kuthodaw Pagoda, whose 729 marble stone slabs of Buddhist scriptures have earned it the title ‘World’s Biggest Book’. Continue to Shwenandaw Monastery, the only remaining building from the 19th century Royal Palace. This grand teak building is known for its exquisite woodcarving.